In this video, we make a rare colonial-era treat known as “An Orange Fool” recently featured in a written blog post about where colonial Americans got their fresh fruit from. You can find the blog post and the “Orange Fool” recipe here. Where Did the Fruit Come From? In our age of weekly farmers’ markets, drive-thru smoothie shops, and 24/7 grocery stores, it can be hard to truly understand the importance of fruit to the average colonial Virginian. They, however, would have been well aware of how rare it was and of what it meant to have it. Indeed, they were so aware of its rarity and luxury that they bought and used special dishes in which to serve the fruit. We recently wrote in “Fine and Fashionable Fruit Dishes” about just such white, salt-gazed fruit dish excavated at George Washington’s Ferry Farm. Just how rare was fresh fruit in colonial America and, when it was available, where did it come from? 18th century fruit dish in Kenmore’s ceramics collection. 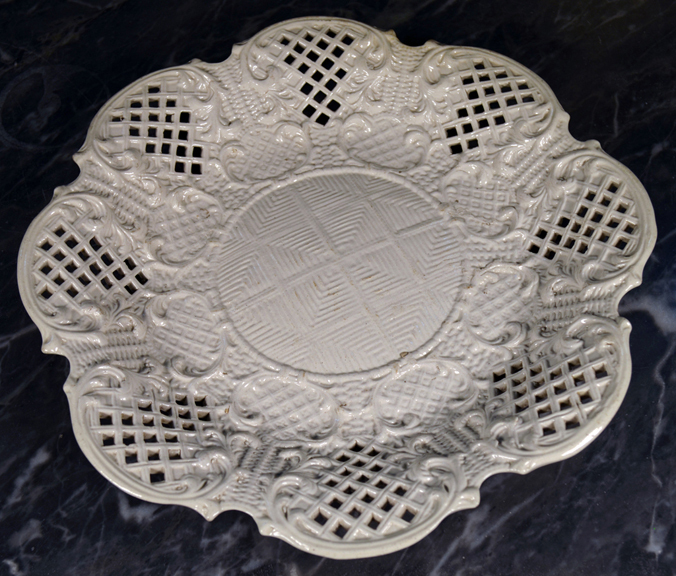 The dish is white salt-glazed stoneware with a geometric design in the center surrounded by a variation of the basket-dot-diaper motif and an intricately pierced rim flanked by scroll-work. Historians have surveyed old records from stores, taverns, and ordinary households to figure out how often early Americans ate fruit. One such study ranked different foods according to the amount of money spent on them. In this ranking, fruit came in eighth after meat/poultry, grains, alcohol, and other foods. Ultimately, paired with nuts, fruit accounted for less than 3% of the overall food expenses in Virginian households. The same study examined the food expenses of people at all levels of society, whether an anonymous wigmaker or the royal governor. From 1769 to 1770, fruit/nuts were nearly 8% of the royal governor’s food expenses while most other Virginians spent less than 1% of their food expenses on fruit/nuts. Fruit was for the wealthy and was a rare luxury in 18th century America. The rarity of this luxury was a direct result of where fruit grew and how people got it. There were two options when it came to fruit for the colonists; locally grown or imported. For most, of course, locally-sourced seasonal produce was really the only option. 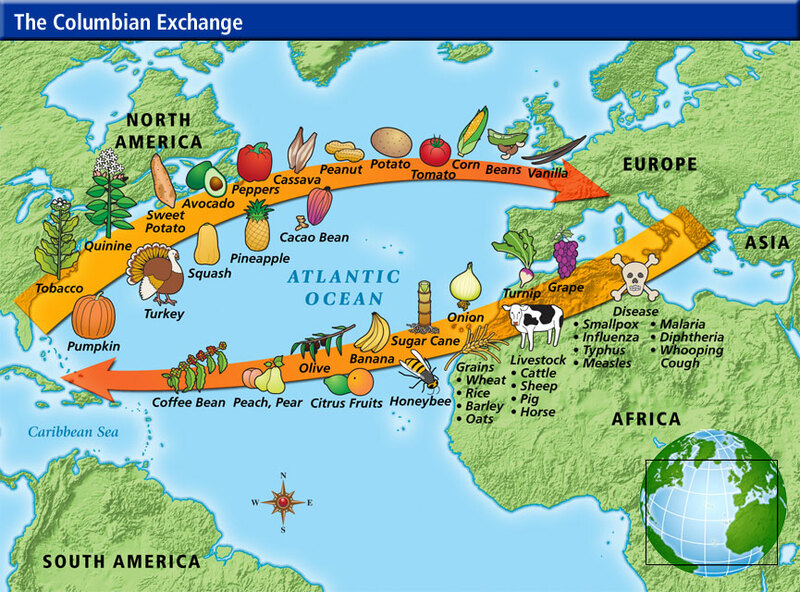 A global exchange of livestock, diseases, fruits and vegetables sometimes called “The Columbian Exchange” began with European exploration of the Americas in 16th century. By the mid-1700s, the American colonies were a unique place for growing fruit. Europeans transplanted old favorites — quinces, apples and peaches — to the New World. They enjoyed new varieties of fruits — strawberries, cherries, and grapes — in America that had closely related cousins in England and Europe. Then, they added to their diet fruits naturally indigenous to the Americas. These included fruits well-known today like cranberries and blueberries as well as fruits now largely forgotten like pawpaws. With all that variety, early Americans still had to settle for what could be grown in their specific climate and at a particular time of the year. Even local fruit, whether transplanted or indigenous, was an expensive luxury. Naturally, tropical species like citrus fruits and pineapples became the zenith of the colonial fruit hierarchy. If someone really wanted to demonstrate their wealth, these imported fruits were the way to go. They could not be acquired locally and indicated the buyer had deep pockets as well as a more sophisticated palate. While wealthy Virginians attempted to grow some of these fruits in private “orangeries”, the precursor to modern greenhouses, they mostly came from islands in the Caribbean. Transportation made them extraordinarily expensive but their expense did not mean there was any shortage of uses for them. 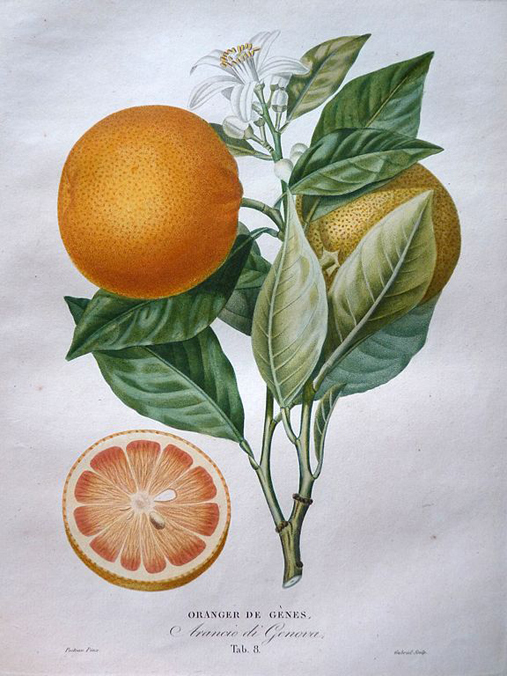 Illustration of an orange by Pierre Antoine Poiteau (1766-1854) and published in his Histoire naturelle des orangers or “Natural History of the Orange Trees” (1818). Because they symbolized wealth and simply had a short shelf life, fresh fruit was displayed on a fruit dish or epergne as a decoration and status symbol. Fruit’s value also came from its multiple uses within a home. Cookbooks of the time gave plenty of uses for fruit ranging from the familiar such as apple dumplings to the foreign like salt pickled lemon. The most commonplace recipes (or receipts as they were referred to in that period) concentrated on preserving fruits so that colonists could enjoy their flavors throughout the year. To conclude, we present a receipt from Hannah Glasse’s The Art of Cookery Made Plain and Easy, a book we know was part of the Lewis family library at Kenmore. The receipt’s colonial version comes from a first edition facsimile from 1747. TAKE the Juice of six Oranges and six Eggs well beaten, a Pint of Cream, a quarter of a Pound of Sugar, a little Cinnamon and Nutmeg; mix all together, and keep stirring over a slow Fire, till it is thick, then put in a little Piece of Butter, and keep stirring till cold, and dish it up. Place four 6-ounce (or six 4-ounce) ovenproof cups or ramekins in a deep baking pan just large enough to hold them. Fill baking pan with enough water to come halfway up the pan. Add cream, orange juice, zest, and 1/3 c of sugar to a small saucepan and bring to medium heat until sugar has dissolved and the mixture starts to steam. Add butter. Meanwhile whisk the egg, yolks, and vanilla extract together in a separate bowl. Once the orange cream mixture has come to temperature remove from heat and use a ladle to slowly pour it into egg mixture while vigorously whisking the eggs. Once the cream and eggs are fully incorporated return them to the small saucepan and put back onto low heat. Let the custard steam but NOT simmer (approx. 175 degrees). Take off heat and pour into ramekins through a fine strainer. Mix the remaining sugar, cinnamon, and nutmeg together and sprinkle onto each cup. Let cool at room temperature for 1 hour and serve. OR chill in the refrigerator overnight for a cool summer dessert. Next time you pour yourself a fresh glass of orange juice, buy some fresh fruit at the grocery store, or stop a farm stand by the road for apples remember the luxury that you are enjoying. This aspect of our daily lives is an opportunity of which our forefathers would have been sincerely jealous. Walsh, Lorena S., Ann Smart Martin and Joanne Bowen. Provisioning Early American Towns. The Chesapeake: A Multidisciplinary Case Study. Williamsburg: The Colonial Williamsburg Foundation, 1997: 141. Fruit! It’s good for you, delicious, and often beautiful – but have you ever thought of fruit as a status symbol? In today’s world of relatively quick, inexpensive long-distance transportation, we enjoy fresh fruit from all over the world year-round. We generally take this ability for granted. In the eighteenth century, however, if you or your neighbors didn’t grow a particular fruit at home, then it had to be shipped to you at great cost. In this age before refrigerated shipping, fruit’s extremely short shelf life was magnified. As a result, a simple pineapple or lime represented a household’s wealth and the display of expensive fruits was a way to impress dinner guests. If you’ve got it, flaunt it, right? Fruit proved such a rare luxury in the 1700s that people purchased special dishes in which to serve the fruit. These dishes also emphasized the social status of the owner because they signaled to people that this person could afford fresh fruit even if none might be available at the moment. Like the fruit, the dishes themselves came to the owner’s table from all the way across an ocean, further emphasizing their wealth. Archaeologically, we’ve recovered one such special fruit dish from George Washington’s Ferry Farm. Made of white salt-glazed stoneware around 1755, this favorite ceramic of Mary Washington, George’s mother, is heavily decorated. The entire surface of the object has some visually interesting thing to catch the eye. With a geometric design in the center surrounded by a variation of the basket-dot-diaper motif common to the time period and an intricately pierced rim flanked by scroll-work, this dish would certainly have been highly valued in the Washington household. The fruit dish sherds excavated at Ferry Farm. In the eighteenth century, one of the most important ways a person could display their standing and refinement was by hosting elaborate dinners. This meant having extravagant and highly decorated centerpieces, preferably of silver. However, if you couldn’t afford silver, then a ceramic equivalent was the next best thing. Ceramic fruit dishes, like our white salt-glazed one, even borrowed some forms and stylistic elements common on silver dishes of the time. What makes our particular fruit dish found at Ferry Farm even more special is that sherds from an almost identical one were excavated at Mount Vernon. In 1757, not long after George Washington moved to Mount Vernon, he sent to England for a large amount of ceramics, including 100 “white stone” dishes. There were numerous other vessels ordered in white salt-glaze as well, including patty pans, mustard pots, butter dishes, mugs, teapots, slop basins, and more. Having special tablewares just for specific types of foods and condiments impressed your dinner guests with both your financial wealth and your knowledge of the “proper” way to serve things. Having the appropriate tableware was so important that when Washington didn’t receive certain items ordered from England, he complained to his supplier, Thomas Knox, writing that “The Crate of Stone ware don’t [sic] contain a third of the Pieces I am charg’d with, and only two things broke, and everything very high Charg’d.” Though showing disappointment about the broken pieces, Washington’s concern that he did not receive all he ordered hints at how fashionable the stoneware was considered. Also, given the large number of items ordered, it is impressive only two pieces broke. White salt-glazed stoneware was sturdy enough for the Washington family to use every day. 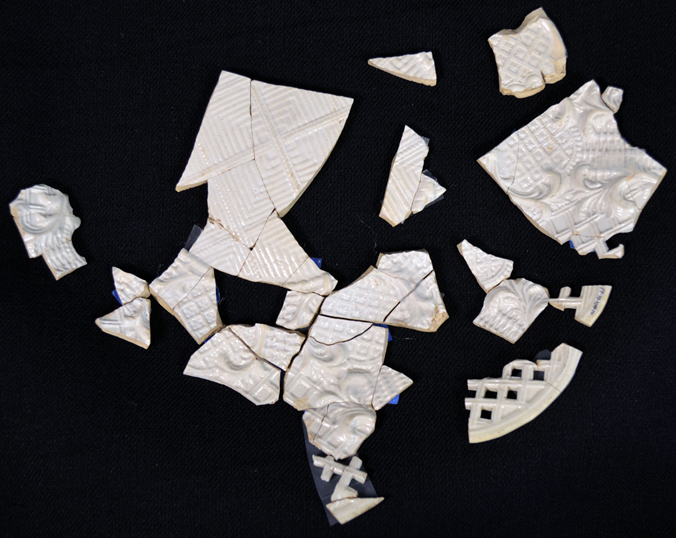 If finding similar ceramic dishes at Ferry Farm and Mount Vernon were not enough, we have also excavated very similar sherds at Historic Kenmore, the home of George’s sister Betty. Apparently, the taste for lovely and heavily molded white salt-glazed dishes must have run in the family! The icing on the cake is that we also have a complete example of a fruit dish in Kenmore’s collection of ceramics that matches the sherds recovered in digs at both Kenmore and Ferry Farm. What are the odds? The complete fruit dish in Kenmore’s ceramics collection. The archaeologists at Ferry Farm are working diligently to mend together as much of Mary Washington’s fruit dish fragments as possible. We’re a third of the way there. We hope to display these excavated pieces next to the complete dish so visitors can enjoy these lovely examples of eighteenth century artwork as much as we do. The Washingtons – Mary, George, and Betty – all went to great lengths to demonstrate their status and refinement to friends and neighbors. They did so, in part, by serving exotic fresh fruit shipped to the colonies from around the Atlantic World. To serve that fruit, they used fine and fashionable ceramic fruit dishes that were also shipped great distances. Think about that the next time you enjoy a fruit cup! Email between Eleanor Breen, Director of Archaeology at George Washington’s Mount Vernon and Melanie Marquis, Archaeology Lab Supervisor at The George Washington Foundation, November 12, 2010. Janine E. Skerry and Suzanne Findlen Hood, Salt-Glazed Stoneware in Early America, University Press of New England, 2009.